SRoC: Slightly Right of Centre: Parliament.uk to move to Creative Commons? 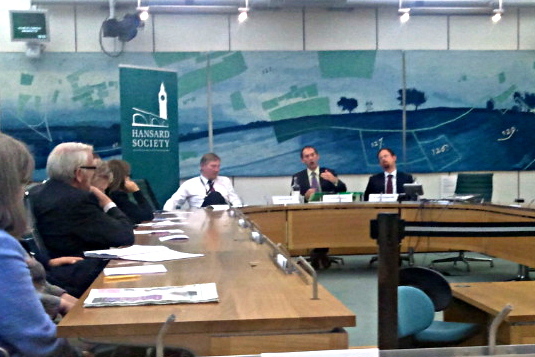 Last night the Hansard Society asked the question: "The digital agenda for change: where are we one year on?" at their democracy (eDemocracy?!) forum in Parliament last night. 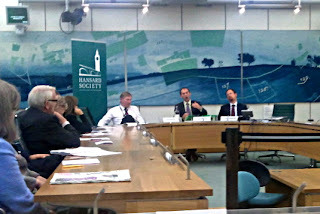 Andy Williamson sat in the chair, with opening speeches from MPs Julian Huppert and Kris Hopkins. Tom Barfield covers the debate on his blog and Andy Williamson has posted his thoughts about Parliamentary Copyright. The most interesting remark of the evening came from Richard Ware in the audience, who happens to be Director of Programmes and Development at Parliamentary ICT. Richard indicated that Parliamentary Copyright, which applies to most content on parliament.uk, could be replaced with a Creative Commons license. This wasn't a firm promise, but it's very encouraging to hear senior parliamentary staff speaking so positively about a change. "Permission from the Clerk of the Records is required for any reproduction of, or extended quotation from, the records, and is usually given provided suitable acknowledgement is made in the work." The key issue is that permission is required, and is only usually given. This leaves scope for parliament to refuse permission to publications it doesn't like, but it also adds an administrative burden and possible delays to organisations wanting to process or re-publish records of debates on their own websites within minutes or hours of publication. A switch-over to Creative Commons (CC) brings 2 key advantages. Firstly, it encourages re-use; and, secondly, the CC license offers instant clarity to those who might be interested in re-use, since there is widespread awareness of what can (and what can not) be done with CC content. A lot of time has gone into simplifying and explaining the six CC licenses. Mr Ware didn't elaborate on what flavour of CC license he thought most suitable. What I consider to be the standard offering CC-BY 3.0 allows sharing and remixing in a commercial or non-commercial operation, but re-publishers are required to credit the copyright owner and make it clear the original content is licensed under Creative Commons. If we are going to move away from a centralised model where government struggles to provide front-end applications to access public data then clearly we have to allow organisations who harness public data to profit. Time and resources are needed, and it's unrealistic to believe these should be donated. Restrictions like Non Commercial or Share Alike might prevent private investment in services. Additional, "non commercial" is a subjective term - a blog might not carry advertising, but could be used to publicise other activities of an individual or organisation. News organisations are commercial, but information in the public interest can be reproduced despite copyright under fair dealing for the "purpose of reporting current events". Parliamentary Copyright only applies to publications of Parliament, so any change would not affect other organisations e.g. using Crown Copyright. And it's only under discussion, but let's hope it comes off and leads the way for other public bodies. UPDATE 18-June-2011: Interesting update from @Joscelyn on her blog - email from The National Archive, who manage both Crown and Parliamentary copyright: parliament intend to move 'later this this year' to an open license, but hasn't decided which. Full story on jossblog.